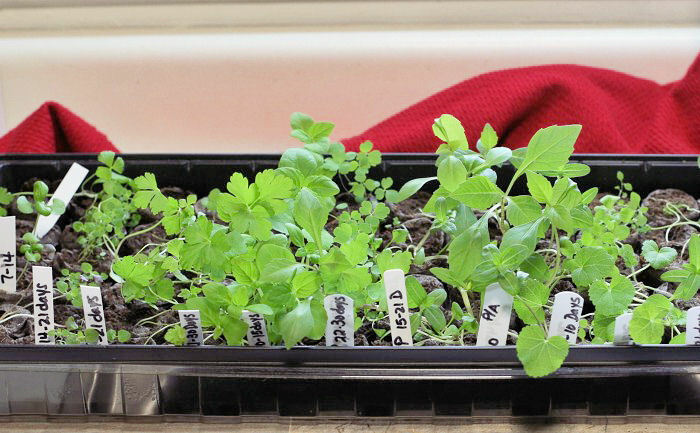 Get a head start on spring gardening by starting seeds indoors with Jiffy Peat Pellets. 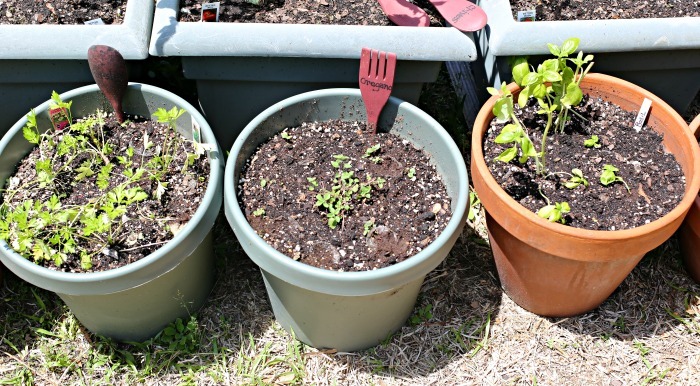 These handy peat pots have the perfect soil for seedlings and they can be transplanted right into the ground as soon as the weather is warm enough. This step by step tutorial features a Jiffy Peat Pellet Greenhouse with perennial, annual & herb seeds. Spring is here and I am chomping at the bit to get out into the garden as often as I can. 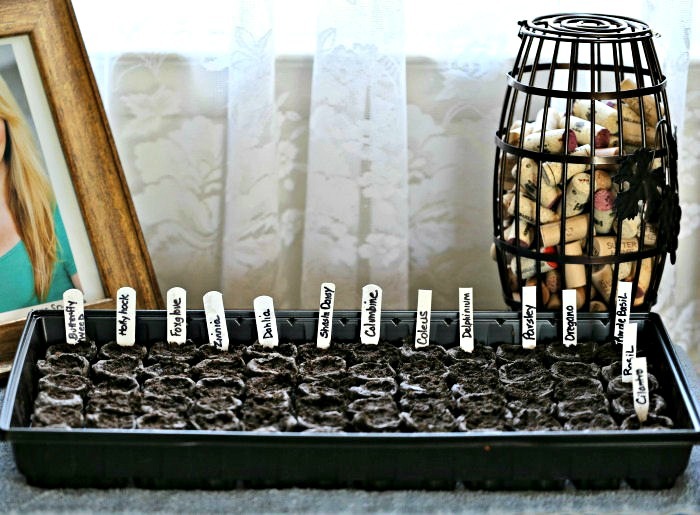 It’s still too cold for tender seedlings in many parts of the country, but I can still get my gardening fix by giving these seeds a few extra weeks indoors. I have a sunny window that faces south that is perfect for the seedlings! What are Jiffy Peat Pellets? 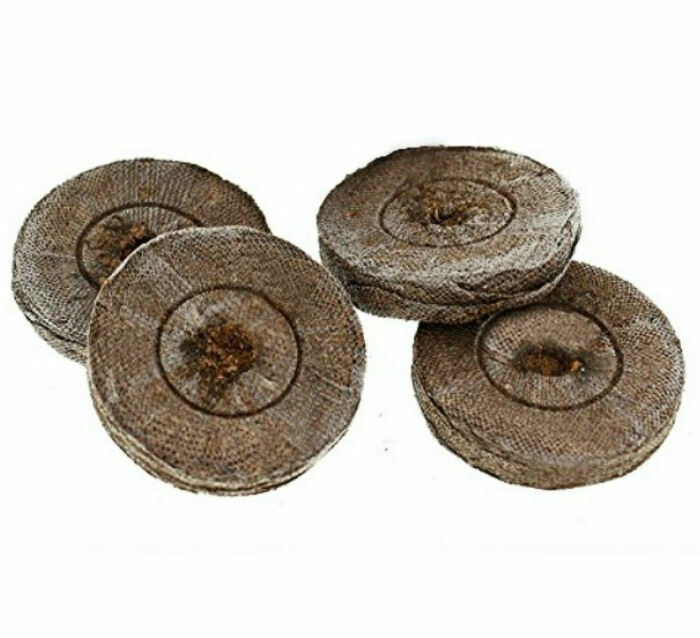 Jiffy peat pellets are small and thin disks made of biodegradable Canadian sphagnum peat moss. When the pellets are watered, they expand to from 36 mm in size to a small peat pot that measure about 1 1/2″ tall. The peat pellets also have a small amount of lime which balances the pH level and some trace fertilizer to get help stimulate the growth of the seedlings. These handy pellets are the ideal medium for starting seeds indoors. The outside of the peat pot has a biodegradable net that holds it together and also enables the pellet to be planted directly in the ground or larger pots when the weather is warm enough. In addition to 72 peat pellets, I am also using a Jiffy Greenhouse Kit to give my seeds the extra benefit of humidity that the plastic dome top adds. It has a long plastic tray with insets for each peat pot to hold them in place and a lid to use while the seeds are germinating. The seeds that I chose were a combination of perennials, biennials, annuals and herbs. Some of the seeds had been stored for a few years in the fridge and others were new seeds that I have just purchased recently. I chose the following seeds for my project: There was nothing particularly special about the seeds. They are common Big Store variety. A few were heirloom seeds but most were hybrids. In case you are wondering about annuals and perennials, check out this article. It’s time to get going on starting seeds indoors. You’ll need to make the pellets larger and ready for the seeds. This means watering them. The peat pellets expand easily. I just added about 1/8 cup of water for each pellet. The water was rain water that I had collected this week in a large bucket. Once the pellets had expanded to about 1 1/2 inches in size, I poured off the excess water, since there is no drainage in the bottom of the container. 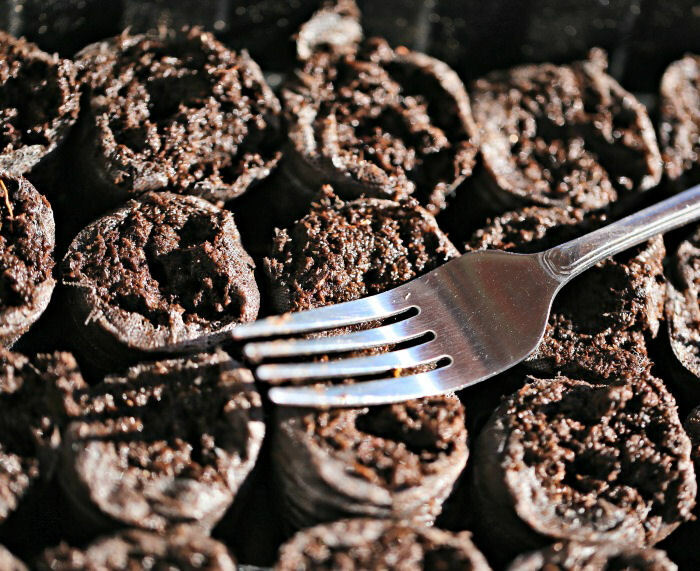 Once the peat pellets are fully expanded, use a fork to loosen the netting on the top. Don’t pull it all the way off though, since this netting keeps the peat pellet in one piece. For me, starting seeds indoors means labeling so I don’t forget what I have planted. 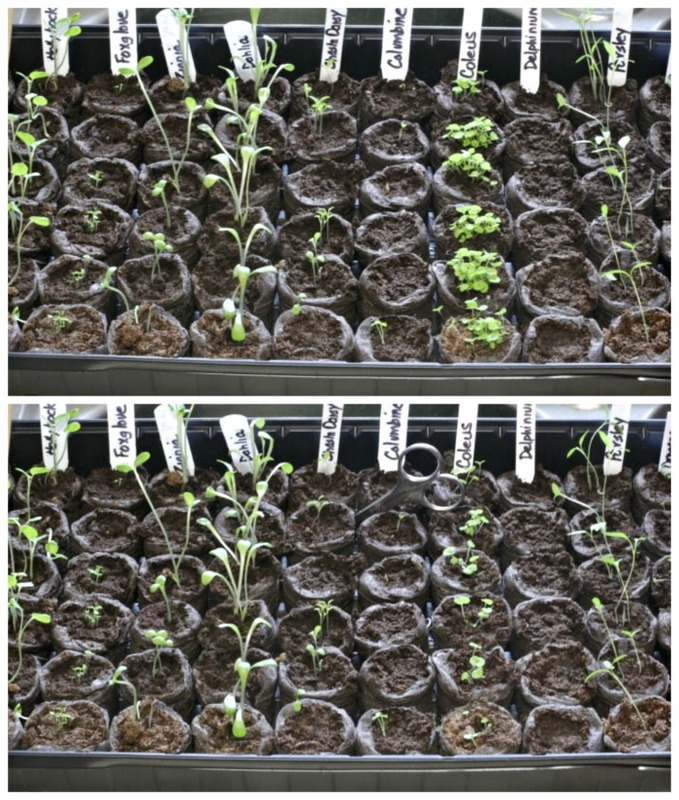 Use plant markers and label them with the name of the seed on one side and the days to germination on the other. I found it a good idea to label my rows as I went from seed to seed. They all look the same in the end and trying to remember which row was which seed is easier if you add the markers as you go. Plant three seeds in each pellet. This is harder to do when the seeds are tiny, which is the case with many perennial seeds, so just do the best you can. I just planted 6 pellets of each seeds until I got to the herbs and planted less of the purple basil, sweet basil and cilantro. When everything is all planted, place your greenhouse tray in a warm area that is out of direct sunlight. I placed mine in a North facing window. A special plant heat mat can be used to give heat from the bottom to help the seeds to germinate. It won’t be long before your seeds will sprout. 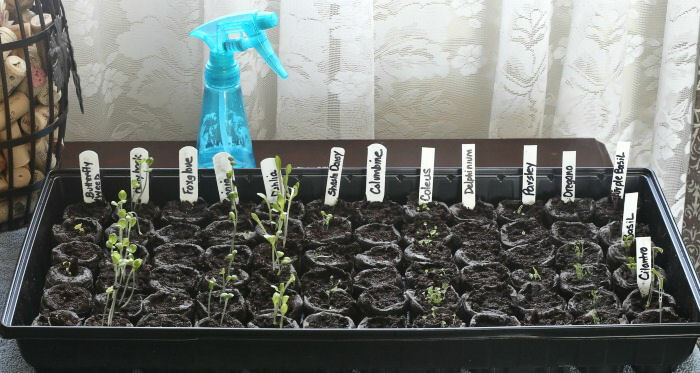 Mine were marked at an average of 7 to 21 days and many of them had sprouted in just a week. Once the seedlings have started to sprout, prop the dome cover up so that it is open. I used some wooded craft sticks to hold the lid open. 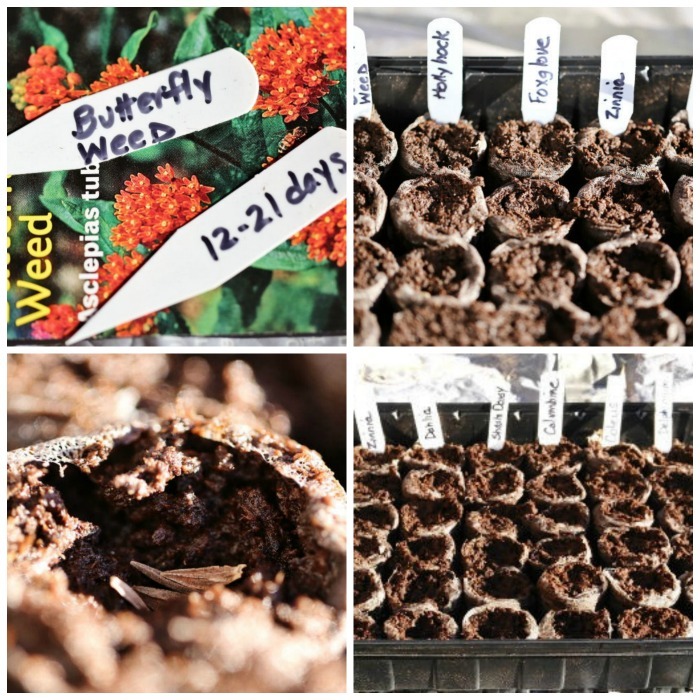 You will likely get several seedlings in each pellet and, depending on how tiny the seeds were and how many you planted, they may be very crowded. Time to thin the herd! I used a tiny pair of manicure scissors to trim off the sprouts where there were many little plants growing together. If you leave them that way, you will choke them and they won’t grow well. Thinning seedlings allows more air to circulate around the tiny plants and gives them plenty of growing room. Many of my seeds were super small, so I had a lot of really crowded baby plants. I used the scissors and some tweezers to trim and remove all but a few healthy ones and this gave them a little more room to develop. In another week, the true leaves appeared (the second set of leaves). When this happened, I cut back all but the very strongest seedling growing in each peat pellet and removed the dome of the tray so as not to hamper their growth. I had to water more carefully now. With the lid domed up, you’ll need to watch the watering a bit more. A plant mister is a good way to keep the moisture even without soaking the pellets which can cause the seeds to rot. Now is the time to give the seedlings more light. I moved my tray to a South facing window and kept a good eye on the moisture level. With the domed cover propped open, the peat pots will dry out more quickly. After another 10 days, I had lots of plants that had good growth that were ready to plant. 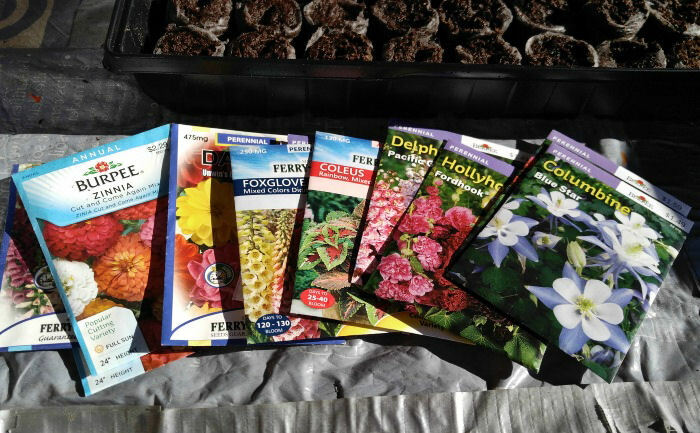 Once the weather is warm enough and the seedlings are growing well, it will be time to get them used to the weather outside. Take it slowly for this step. 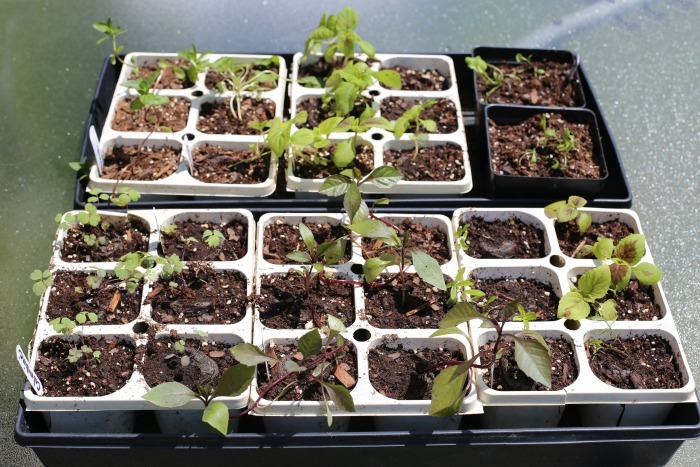 Tender seedlings will not like it if you place them directly in the garden, or even if you place the tray outside in full sun so they need to be hardened off. I chose a day when it was overcast for the first day and gave the planter just a few hours outdoors. Be sure to place the tray in a shady spot during the day and bring it indoors at night when it is cooler. 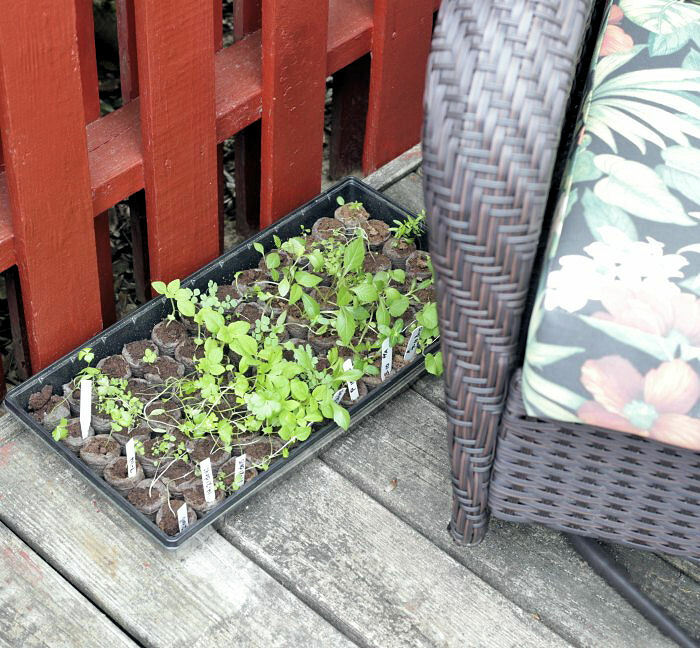 A corner between a wall and my outdoor chair gave it the shade the tray of peat pellet seedlings needed. 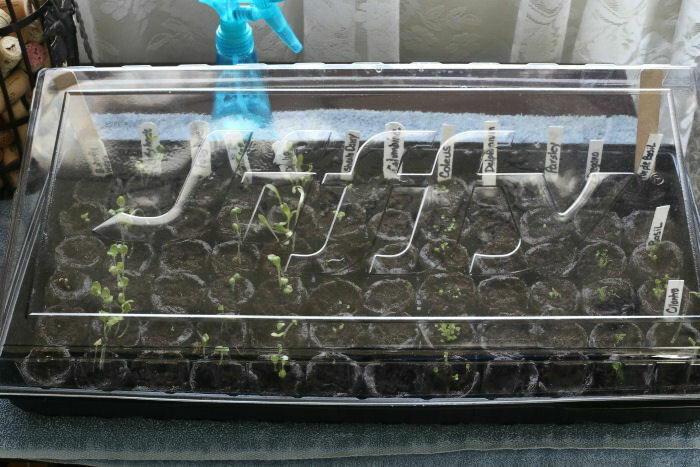 All I had to do was move the tray more into the light each day until the seedlings got hardened to the outdoor weather and had a chance to get used to the full sun. Be sure to bring the tray back in each night until the hardening process is complete. Transplanting the seedlings is very easy, since the whole peat pellet can be planted so there is less of a chance of transplant shock. For my herb seedlings, I just added whole peat pellet and seedling into large pots surrounding a slightly more established plant. These pots get watered every day, so they will grow just fine. I have a large garden stand that held all the plant trays. It’s very close to the water supply to make sure that the seedlings get the water they need to flourish. Once the plants really started growing, it is time to put them in their permanent home in the garden. Since I have 11 garden beds, I have no shortage of spaces for the plants to grow. Some went into very large planters that get regular watering and others got planted right into the soil. 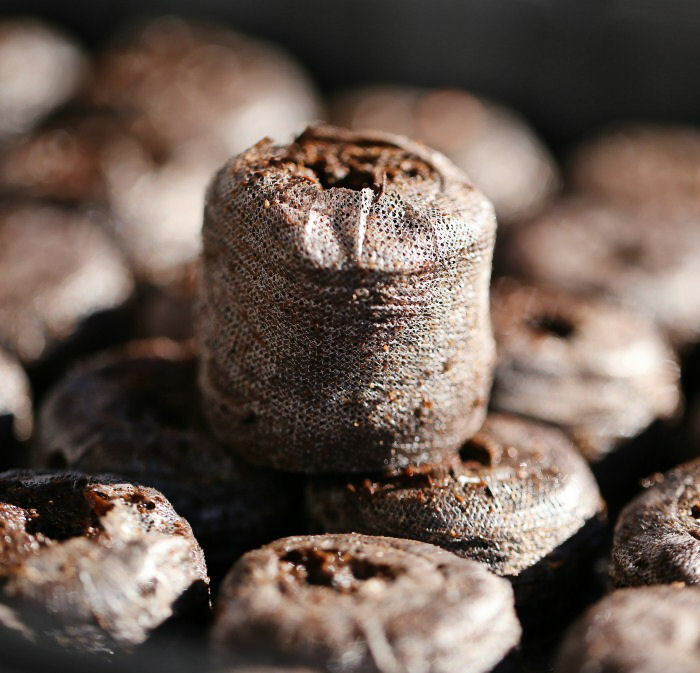 To transplant the peat pots, dig a small hole that is deep enough to cover just over the top of the pellets. Place the seedling in the hole and add some soil over the top of the pellet. Gently firm around the pellet and water. Be sure to keep an eye on the soil around the pellet to make sure it doesn’t dry out. The biodegradable net will break down and the seedlings will send out roots into the surrounding soil before you know it. I thought that my seedlings would get enough sunlight since they were in a south facing window that got sunlight most of the day. However, all of my seedlings, except for the coleus, butterfly weed, dahlia and columbine got quite leggy. The parsley grew almost like a vine. 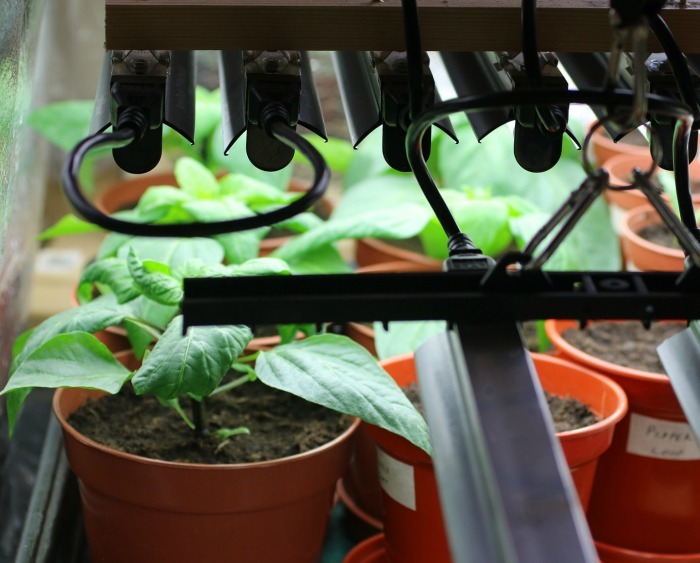 So, depending on the seeds you start and how much sunlight that type of plant ideally likes, using a grow light might be a good idea to give you more compact plants. Once the plants have the true leaves and are in the hardening off stage, they will be getting more sunlight anyway, so a grow light is just a help when the seeds are first starting to grow, particularly if they are reaching for the light. I find that garden centers are charging more and more for annuals in the last few years. Instead, try starting seeds indoors by buying your own seeds and a peat pellet greenhouse tray and you’ll have dozens of plants at very little cost. The tray and dome can be reused by just purchasing the peat pellets on their own the next time, saving even more money. 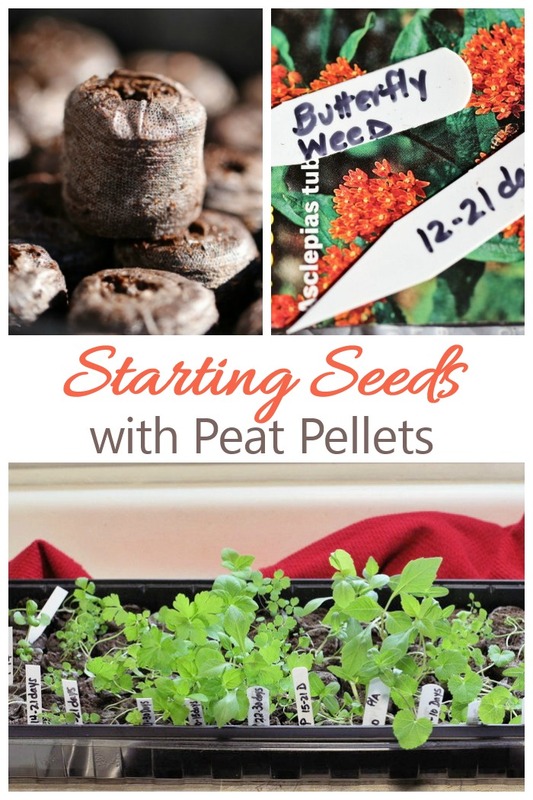 I used your article to explain the need to thin the seedlings to one per peat pellet.